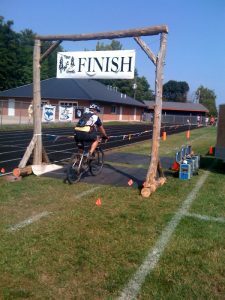 Racers at the Tour Da Woods enjoyed sunshine, beautiful views, and Munising hospitality. It was a perfect day for a bike ride, with temperatures easing their ways into the 80’s later in the afternoon. Thanks to the Anna River Pedalers for putting on a great race. Tour Da Woods Finishers print off their results receipt provided by Superior Timing! This entry was posted on Saturday, September 12th, 2009 and is filed under Race Results. You can follow any responses to this entry through RSS 2.0. You can leave a response, or trackback from your own site.